Whether you fear your own rage or that of others, discover how to keep anger under instead of in control. Best-selling authors LaHaye and Phillips provide "Anger Inventory" and other exercises that offer healing for damaged relationships. Understand where anger comes from, how it does or doesn't show, and what you can do about it. What you need to know to control the emotion of anger and find healing for damaged relationships. Anger is something everyone struggles with—whether it’s our own emotion threatening to explode out of control or the anger of others that makes us feel intimidated and afraid. But when we understand where anger comes from, how it shows or doesn’t show, then we can do something about it. Either it will control us or we will control it, because Anger Is a Choice. • Is it ever right to be angry? Tim LaHaye, D.Min, Litt.D., is a noted author, minister, educator, and nationally recognized speaker on Bible prophecy. He is president of Tim LaHaye Ministries and author of over forty books, including The Act of Marriage and The Act of Marriage After 40 (both with Beverly LaHaye), How to Win Over Depression, Spirit-Controlled Temperament, and the bestselling Left Behind fiction series (with Jerry B. Jenkins). Tim and his wife, Beverly, live in Southern California. Bob Phillips, Ph.D., is a licensed counselor and the director at large for Hume Lake Christian Camps, one of the nation’s largest youth camping programs. He is the bestselling author of over seventy books. 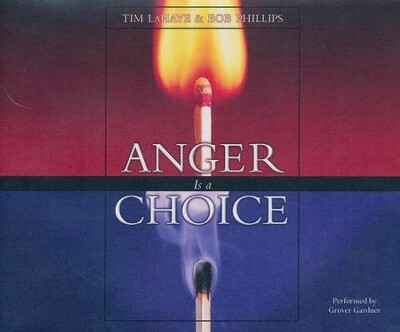 I'm the author/artist and I want to review Anger Is a Choice - unabridged audio book on CD.